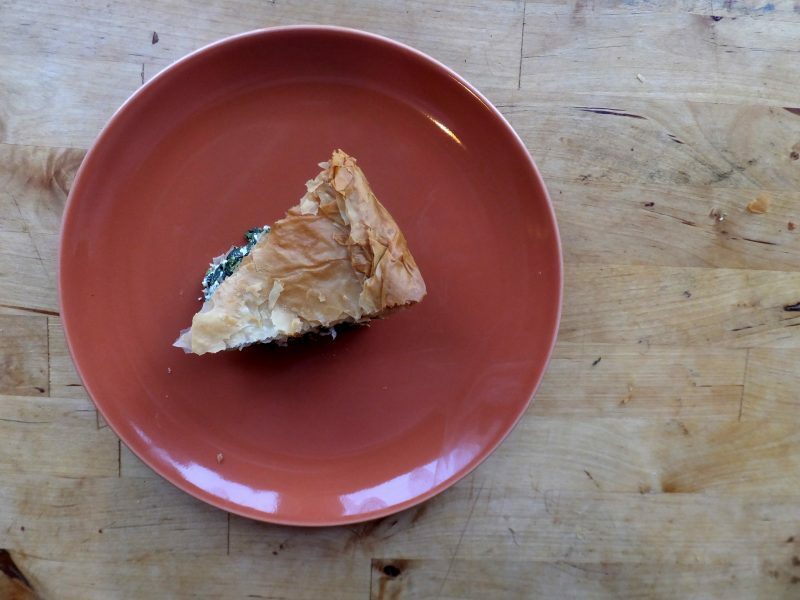 You may know spanakopita as the little triangle appetizers which come in packs of 100. They were probably served at New Year’s Eve parties by your cool friend’s mom. Those things are super delicious and and a great breakfast on January 1st, but I doubt their authenticity and have a hunch they’re just a product of Big Appa. 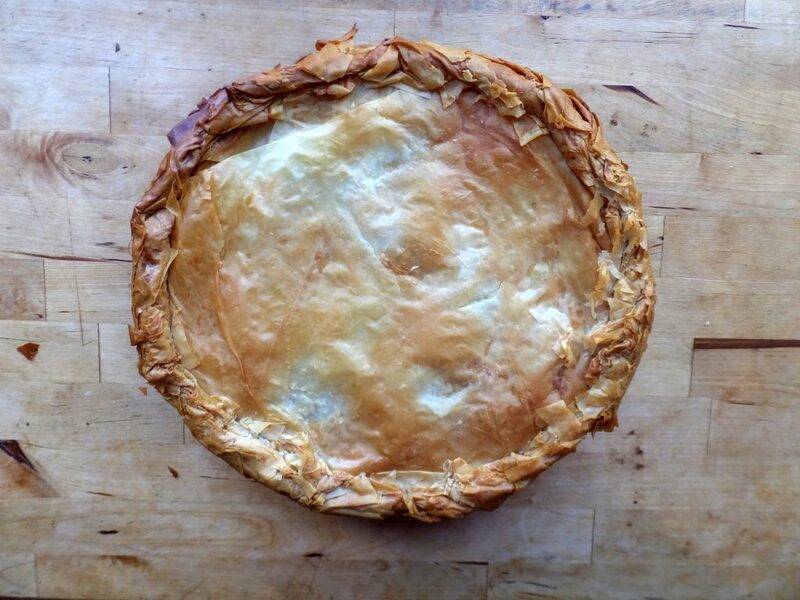 The times I’ve ordered spanakopita at a real Greek restaurant it has come in pie form, so that’s what I decided to make. This is not a dish to toss together at 8:30 PM on a Sunday. 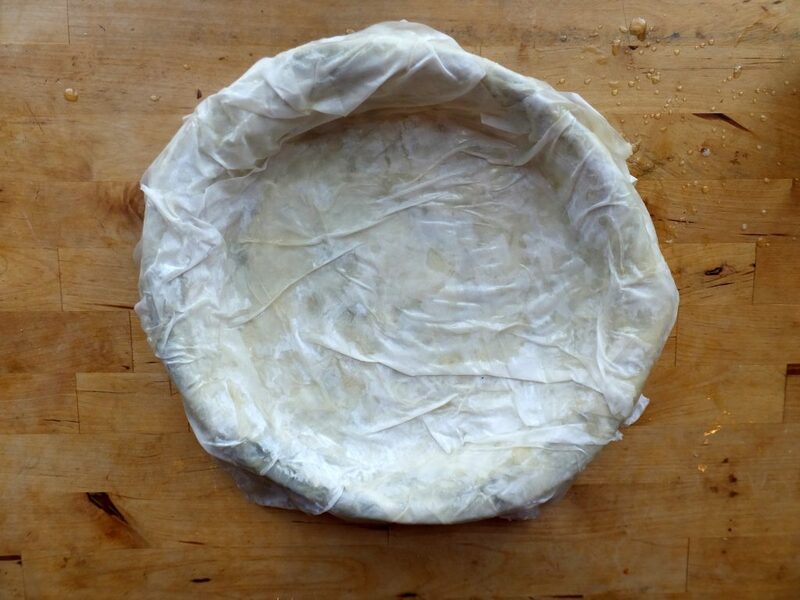 Preparation is required and working with filo dough is a pain. 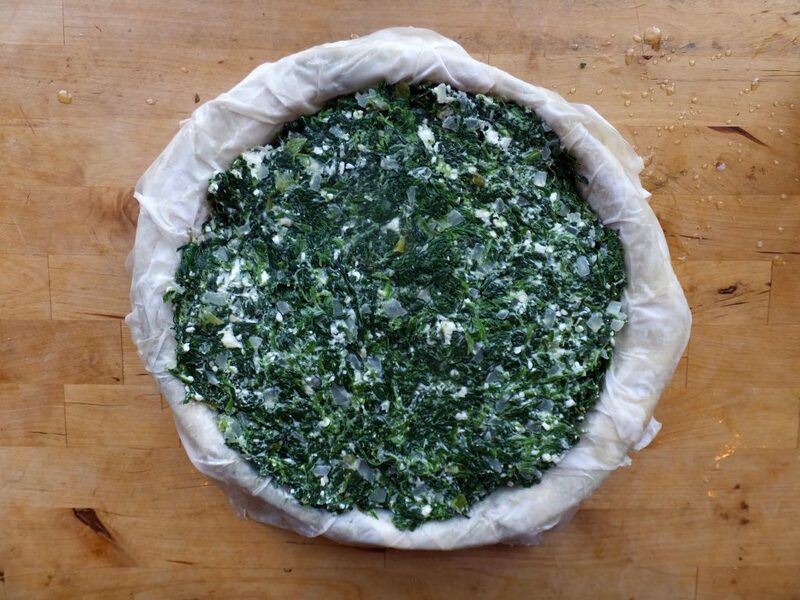 It may be best to recruit a partner, both for cooking purposes and eating purposes (and emotional purposes and tax purposes), because this recipe makes a serious amount of spinach pie. 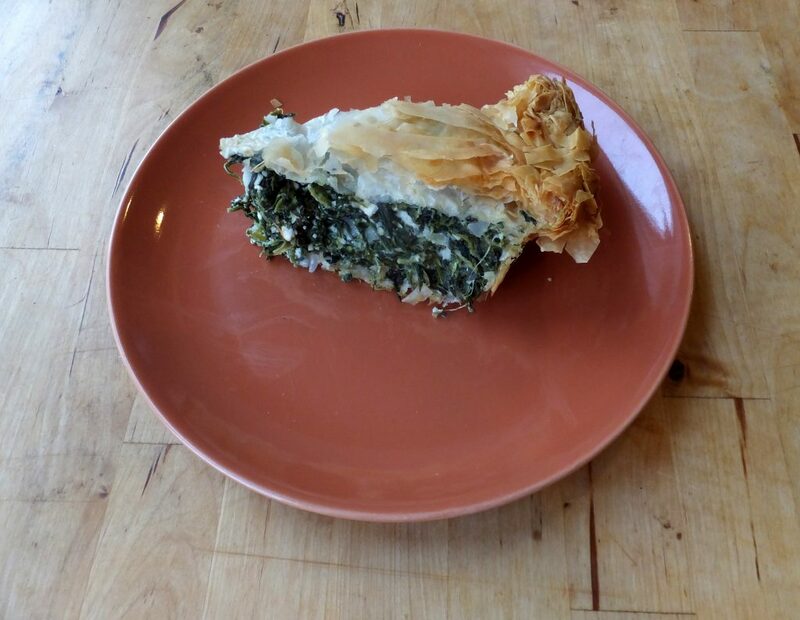 Despite these annoyances, spanakopita is a great way to force some green stuff into your esophagus and it’s really satisfying to pull a pie out of the oven. I considered using fresh spinach, but I don’t think my fridge has enough room to hold the massive amount this recipe would require. 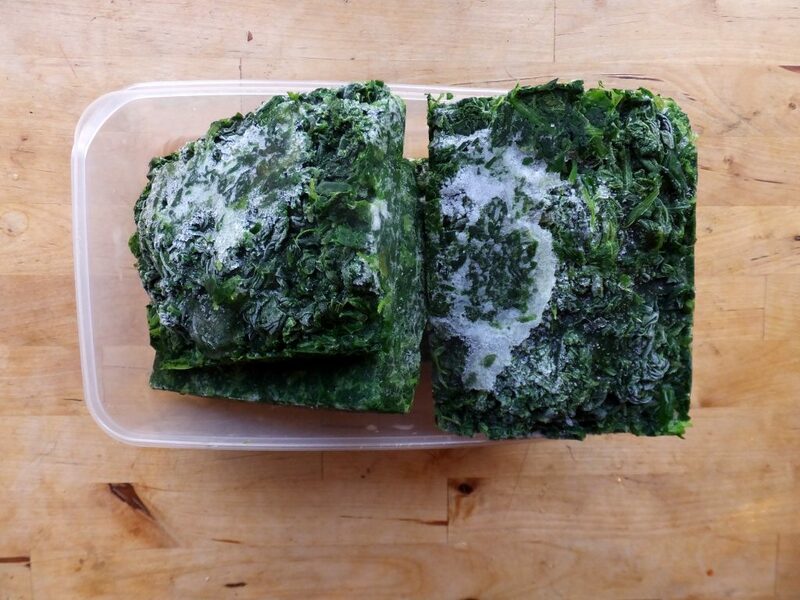 Frozen spinach is the easier option although it does need to be defrosted. 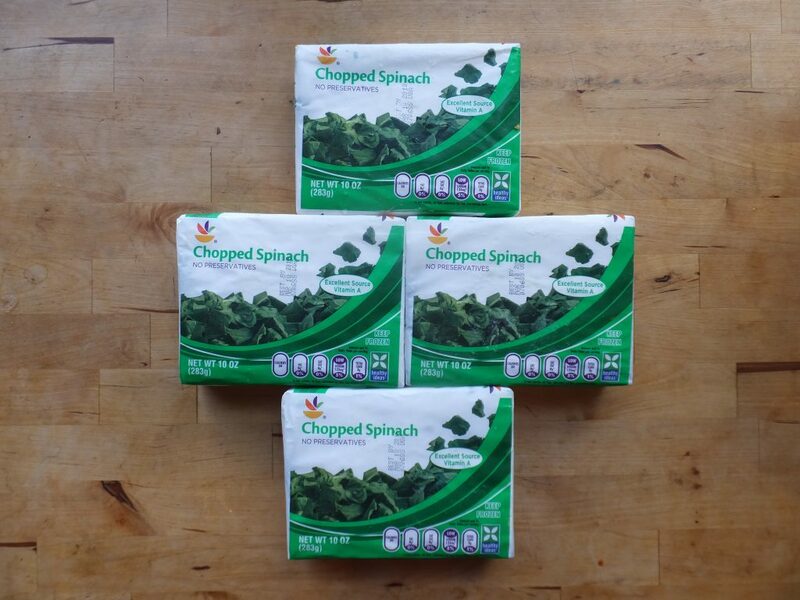 The day before I made the pie I opened all the spinach bricks and put them in a container. Once they melted enough to be squashed down, I stuck them in the fridge. 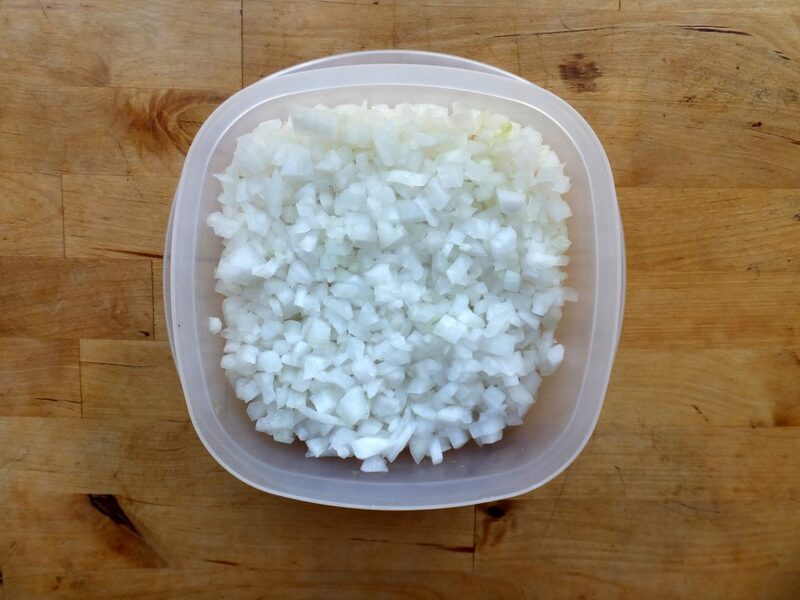 I also prepped by chopping up a white onion. The day has come! 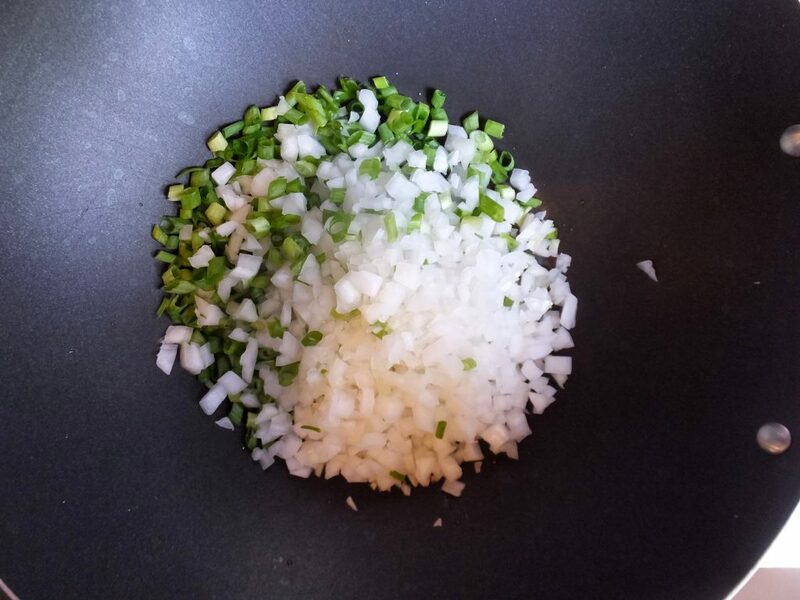 In a large pan, heat up some oil and then add your onions. 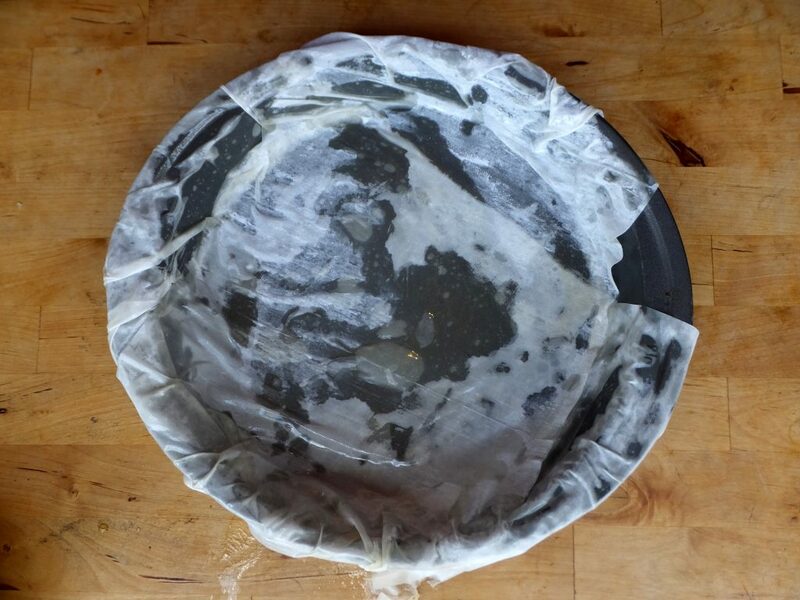 I used my wok because the large flat pan was dirty, but a pan with more surface area is ideal. I just don’t clean pots and pans? Because I’m a jerk? Alright, once the spinach is defrosted you need to de-water it. This took a fair amount of effort, because I wanted it as dry as possible. 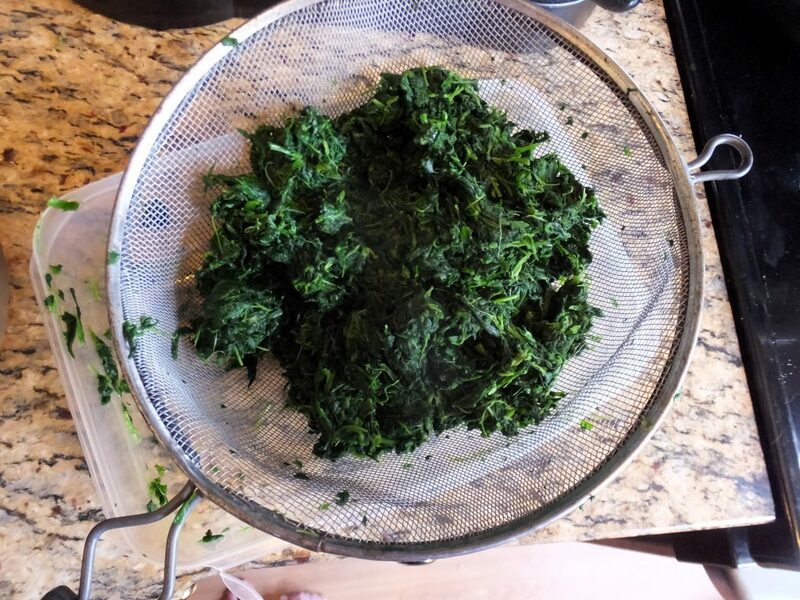 I put the spinach in a flexible strainer and squeezed the whole thing over the sink for about ten minutes. 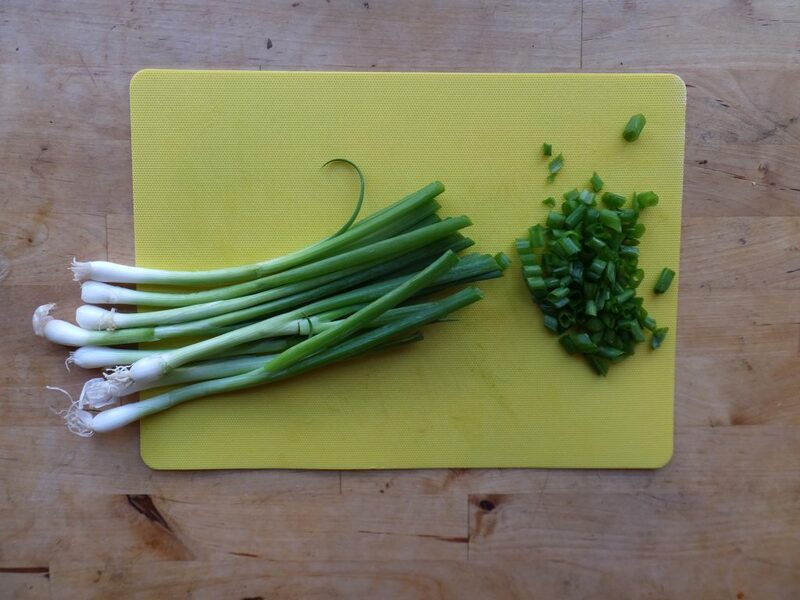 Once your onions are all sweated out, add in a dollop of chopped garlic. 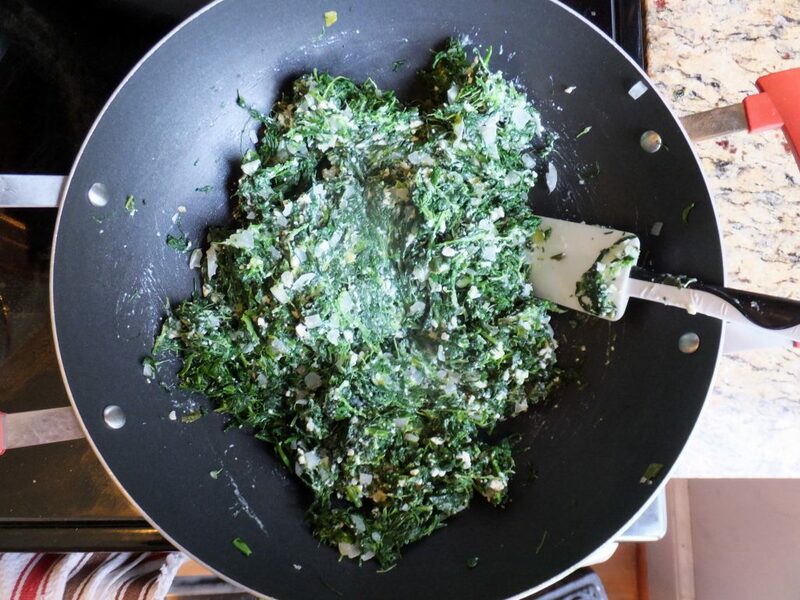 After a minute stir in the squeezed spinach. 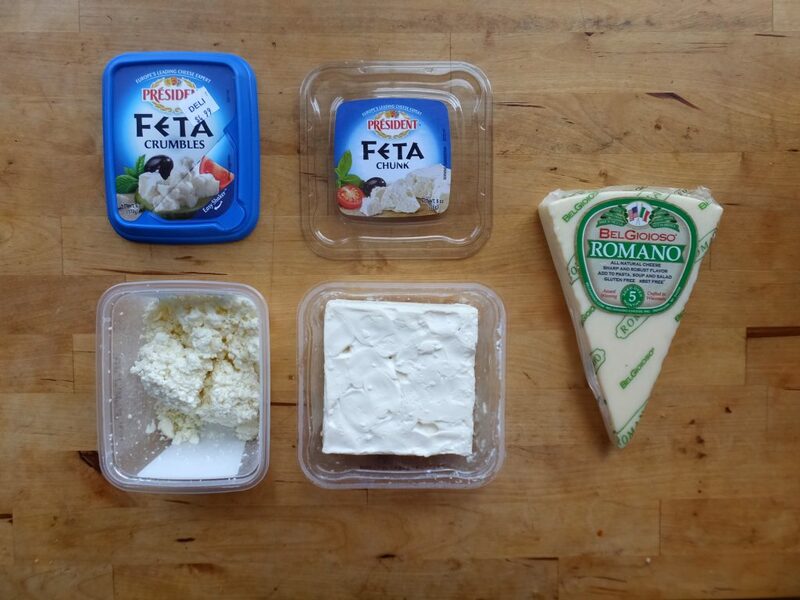 These are the cheeses I used. 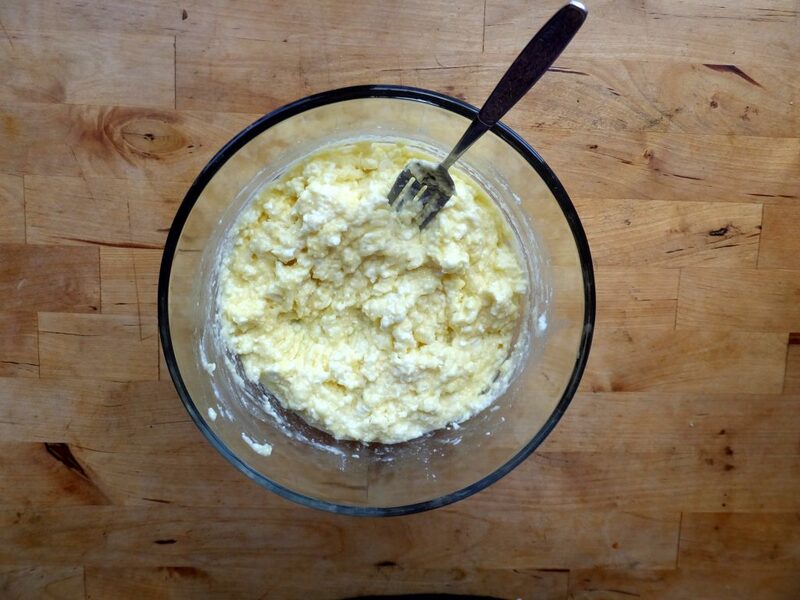 In the future I would use ricotta instead of the rock hard Romano, for extra creaminess. 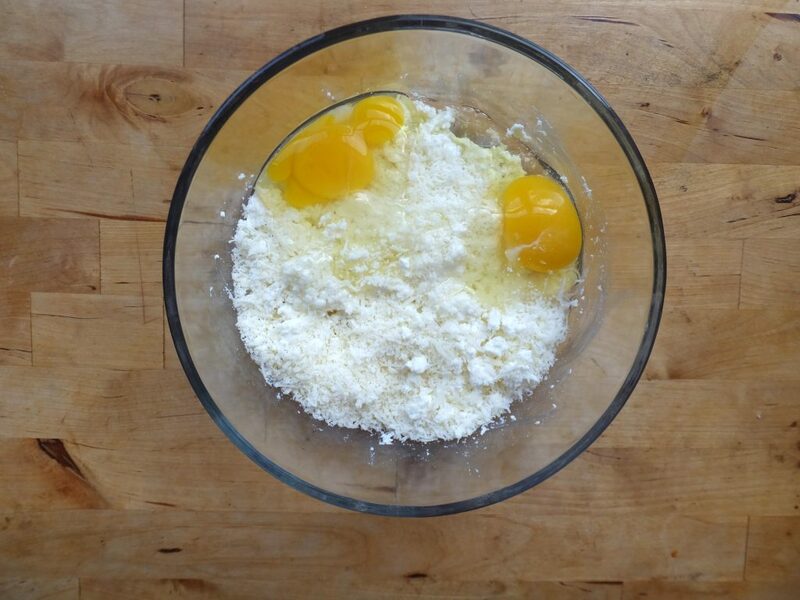 Mix together your cheeses and crack in two eggs. 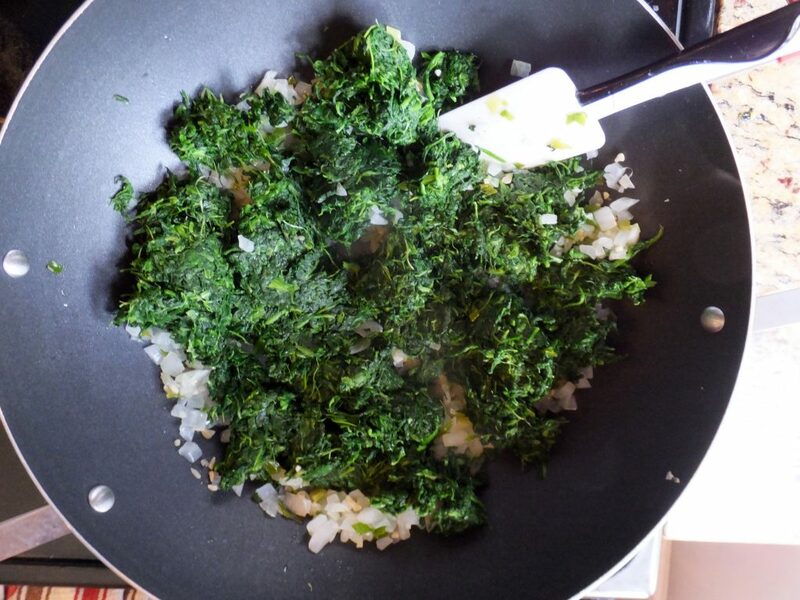 And then add it to the spinach mixture. This is the annoying, but fun, part. My biggest recommendation is to use spray oil, not butter. A spray can will keep your hands and the rest of your kitchen clean. 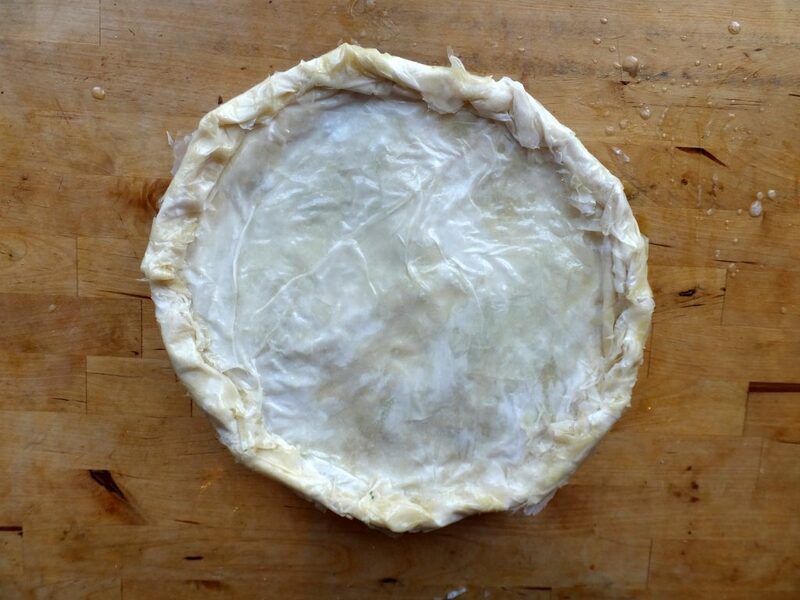 If you choose to use butter, have the proper tools instead of using your fingers like a neanderthal would, if by chance they made pies. 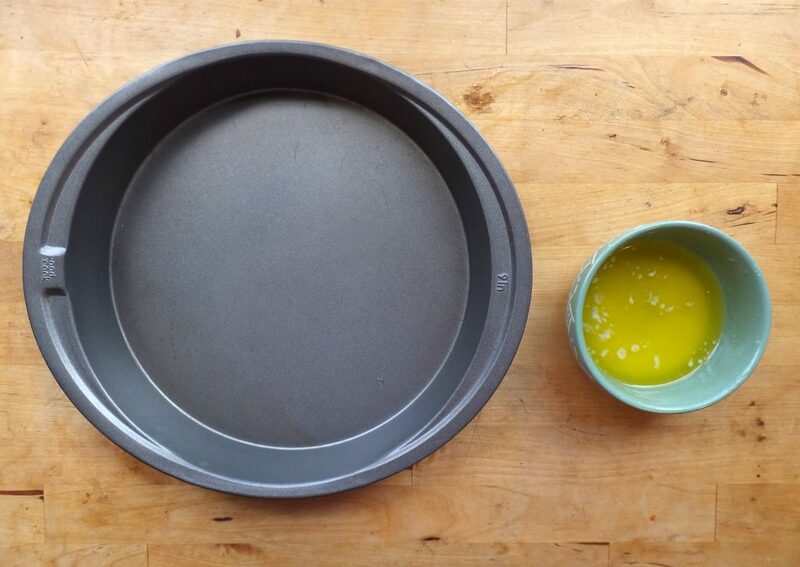 I slathered each layer in butter with my fingers, switching the direction of the sheets each time to cover the pan. About five sheets and six licks of melted butter later. 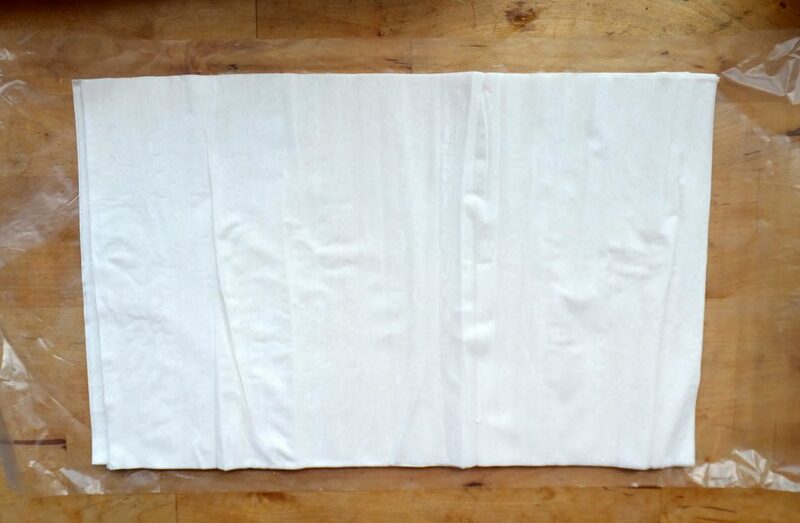 For the bottom layer I used maybe nine sheets in total. I wasn’t sure when to stop but I didn’t have anywhere to be, so I kept on stacking. 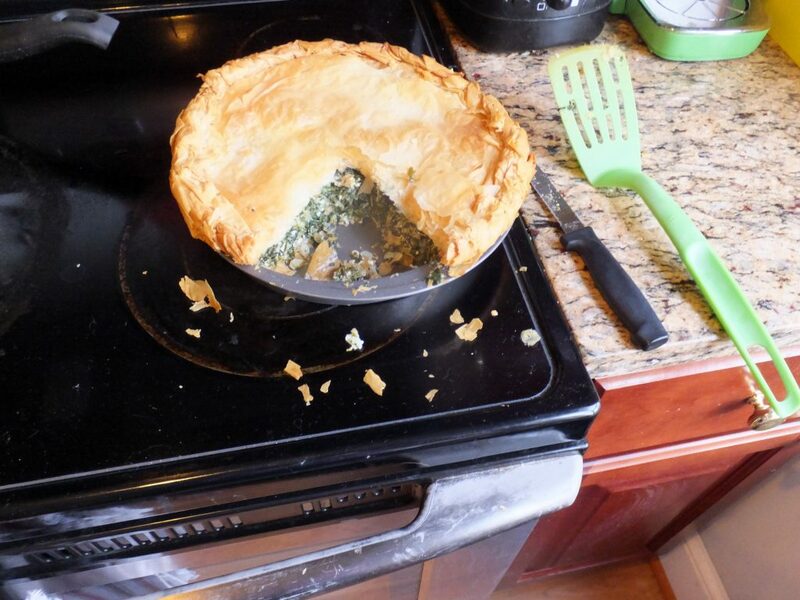 Fill the pie with the spinach cheese mixture. 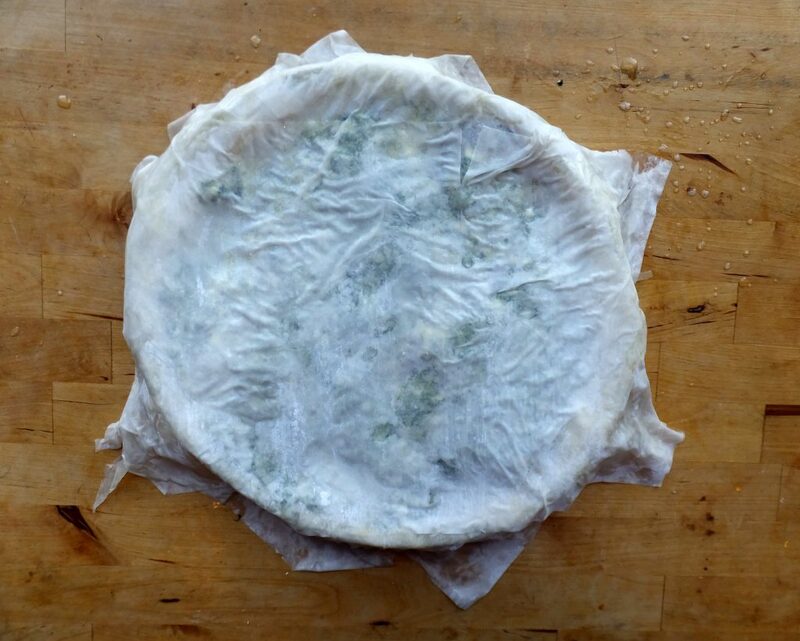 After six or so layers, I rolled the over-hanging filo from the bottom crust into the top crust. 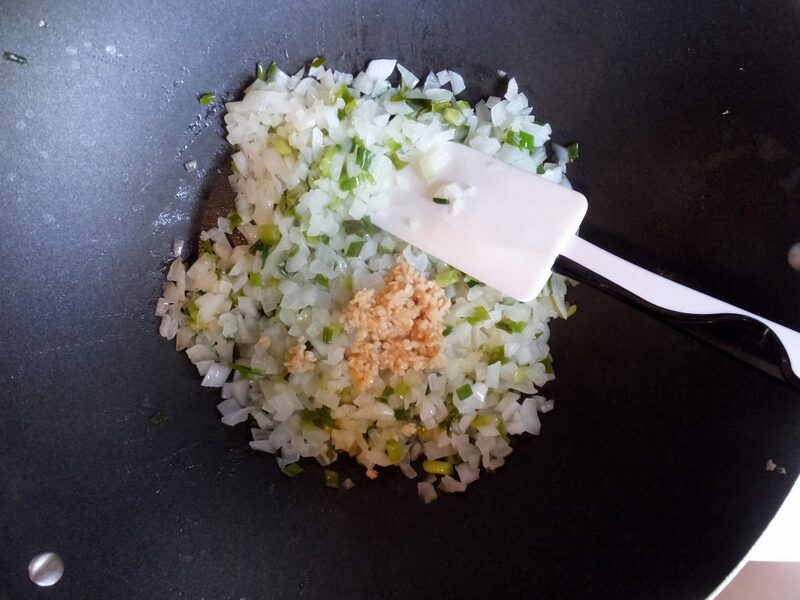 Make sure the top is coated well with butter. Bake for an hour at 350 degrees, until the crust is all golden and…crusty. It came out really well; I consumed the entire thing during my work week. 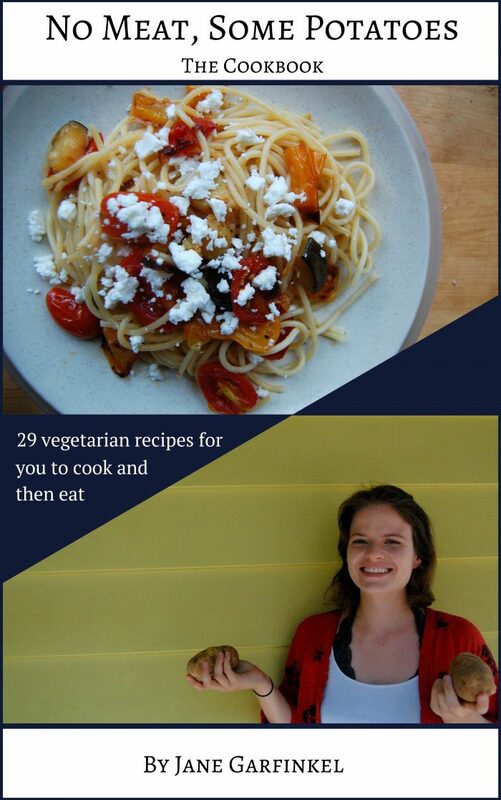 The only change I would make for next time is to use even more cheese. YEAH, MORE CHEESE. PS. 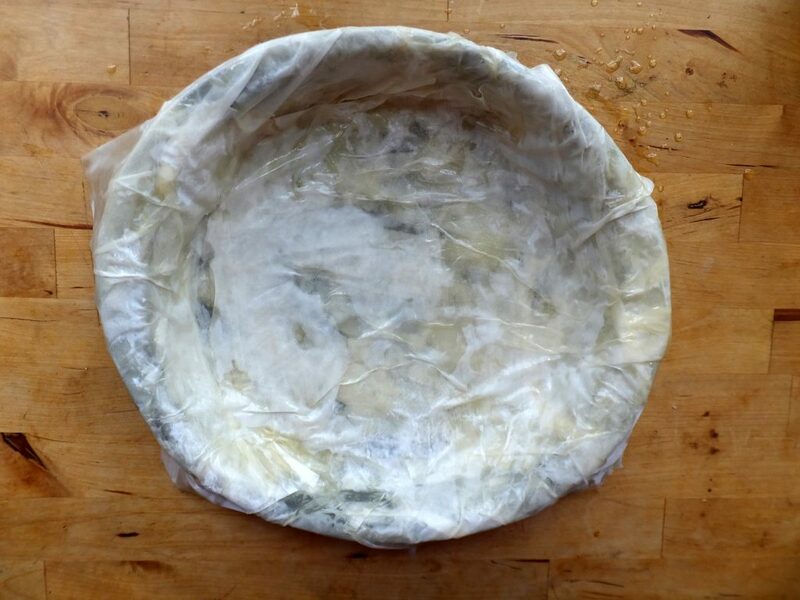 Baked filo dough gets everywhere! I don’t wait for things to cool!